When Scott Bowden got married a decade ago, he never dreamed he’d be spending his 10-year-anniversary with iconic Memphis wrestling announcer Dave Brown. The two former on-air adversaries of the USWA recently reunited over burgers shortly after Bowden traveled from LA to his hometown for his sister’s funeral. While there have been countless features on the late, great Lance Russell, the talented sidekick of ol’ Banana Nose is often underappreciated on a national level because Brown was so subtle in his cool delivery and subtle mannerisms. Brown was so smooth, he made it look easy to maintain his credibility in the wild and wooly world of Memphis wrestling. Bowden and his own loyal sidekick, The Great Brian Last, discuss what made Brown the perfect complement to Russell and spotlight some of the best moments featuring the city’s top weatherman, who picked up the role of the straight man to a heel King Lawler without missing a beat after Russell left for WCW. Bowden also reveals what really happened that day of the infamous angle with Randy Hales that nearly got the arrogant young manager thrown off the air by Brown, and how he wound up back in the doghouse shortly after the initial heat between the two was seemingly hit with a cold front. 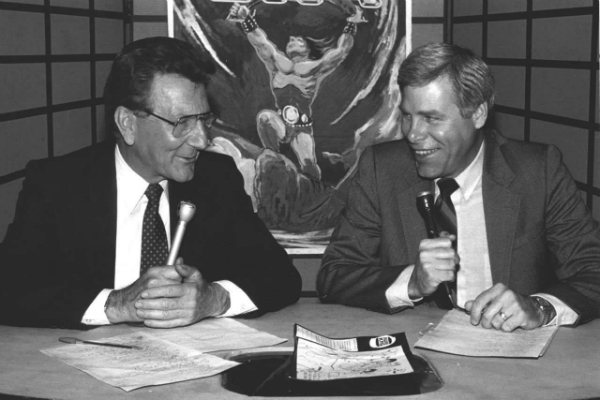 Join us right alongside for another BIG week of Kentucky Fried Rasslin’ as we honor the greatest wrestling announcer duo in history.